The attacks from the right wing on Obama have become increasingly lame. Today’s attack is compounded by their inferiority complex over the decreasing numbers of people who have any interest in their views or candidates. It is possible they can win, as occurred in 2010, due to a reflexive vote against the party in office due to a poor economy, but that should not be mistaken as a real interest in conservative politicians. This sure looks more impressive than those pictures of actual empty seats around Mitt Romney at Ford Field in February. 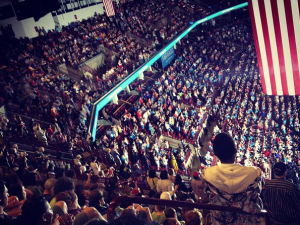 The truth is that President Obama drew 14,000+ in an 18,000 seat arena. 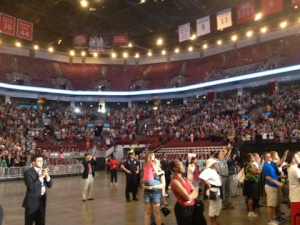 It wasn’t a sellout, but it was about 13,500 more people than Romney’s largest crowd in Ohio. As the Washington Post pointed out Romney has drawn crowds of several thousand during the campaign, what they didn’t mention is that most of his thousands were bused in Mormon college students, but Obama’s crowd today was exponentially bigger than anything Mitt Romney has drawn this year. The right wing media was trying to level the playing field. They want to erase the memory of Mitt Romney giving his big economic address to 80,000 empty seats at Ford Field in Detroit. The problem they have is that even though right wing media does, the photographs don’t lie. Besides the two conservative blogs running this false claim linked to above in the second paragraph, more examples can be found here , here, here, here, and here. I just thought I’d throw in some more links after receiving one of those frequent comments which are immediately removed– a conservative posing as a liberal claiming I lied here as none of the conservative blogs he reads has said this. Obviously not ever conservative blog is repeating this false attack line, but so many are that it is impossible to believe any claims that anyone who has looked at conservative blogs has not seen this. One reason for comment filters is so that we don’t waste time being distracted by conservatives utilizing tactics such as these when the time can be better devoted making arguments for liberal principles and debunking conservative falsehoods.